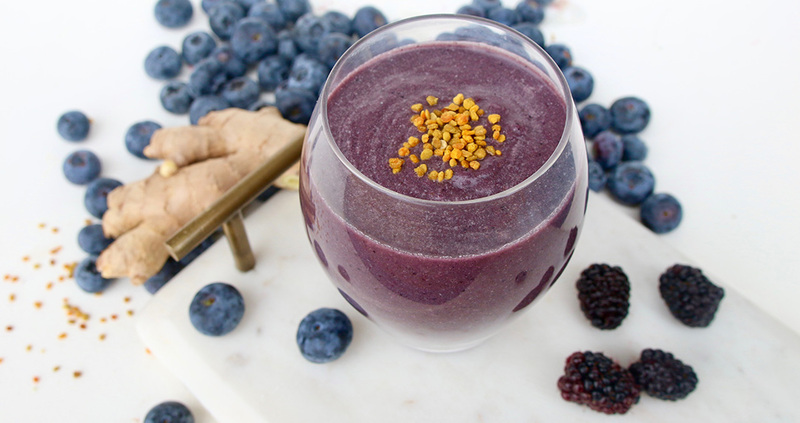 This blue smoothie is packed with superfoods, antioxidants, and B(ee) vitamins! Blue-green algae is a great source of plant-based protein, beta-carotene, trace minerals and chlorophyll, while the bee pollen in this blend is rich in vitamins, minerals, proteins, lipids and fatty acids, enzymes, carotenoids, and bioflavonoids—making it an antibacterial, antifungal and antiviral agent that strengthens the capillaries, reduces inflammation, stimulates the immune system and lowers cholesterol levels naturally. Some folks even say it helps with seasonal allergies! This smoothie is designed to help rebuild mineral deficiencies that follow from late nights and stressful days. *Young Thai coconut meat is often available in the freezer section, already cleaned and puréed. Another option is to buy a young green coconut and scoop out the meat from the inside yourself—one coconut generally offers about ½ cup of coconut meat. Place all ingredients into your blender and purée until smooth. You may want to add extra nut milk or ice for a more liquid consistency.